Here, in the unlikely event Notre Dame wins the national championship, is a key play few outside of the Mormon faith will recall: It’s fourth quarter last Saturday, Brigham Young trailing 17-14, and a Cougar wide receiver named Cody Hoffman splits the hash marks at Notre Dame Stadium, sprinting toward the Irish end zone with absolutely no one in tow. BYU’s left-handed quarterback, Riley Nelson, scrambles to daylight and hurls the ball in his direction, but a wide-open Hoffman, for reasons unknown, pulls up, and the pass thunks onto the turf, accompanied by the breathy whispers of a thousand Hail Marys. 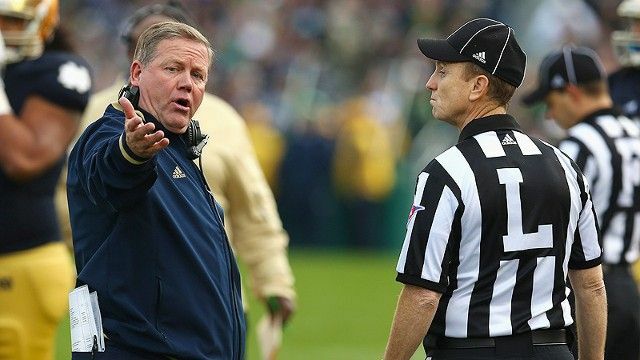 Some 30 minutes after the Fighting Irish had squeezed out their seventh victory of the season, scratching back from a 14-7 halftime deficit, Brian Kelly emerged, attired in a natty gray suit. His face, in tandem with his shirt, was a distinct shade of fuchsia, and his hair was still damp from the shower; his mood appeared rather buoyant. The Notre Dame locker room, he said, was surprisingly dour after the win over BYU, and so he felt obligated to give a pep talk to a team that was still undefeated and seemed to have missed the larger point of this exercise. “I wanted them to know, ‘Listen, you can’t always win games by 28 and 30 points,'” he said. “‘You just need to find ways to win. That’s who we are. Embrace who you are,’ is what I’m saying. A few hours earlier, I stood on a promenade near the campus library and gazed up at a mural of a haloed Jesus, arms outstretched above a gaudy no-huddle formation of saints. The mural’s official designation is The Word of Life, but I had no idea what its official designation was until I looked it up, because I’d only known it from afar, for all these years, as Touchdown Jesus. You can bear witness to Touchdown Jesus from the press box, and from most of the seats in the low-slung bowl of Notre Dame Stadium; it is perhaps the most overt marriage of football and faith in America outside of the New York Jets locker room. On Saturday, the plaza in front of the library was crowded with true believers, Christians and Mormons intermingling with at least one lonely secular Jew, and people took photos with their arms raised, Oppan Jesus Style, and a gang of well-lubricated Notre Dame students charged through the mud and grass and packs of gridiron tourists toward a stadium gate adorned with a statue of Knute Rockne. That same day, the local newspaper, the South Bend Tribune, published a story about BYU fans who had journeyed to Notre Dame especially for this football game. This happens every home weekend in South Bend — there is a sense that one of the reasons Notre Dame football crowds are not particularly loud is because many in attendance are first-time visitors who are gawking at their surroundings1 — but I suppose the religious undertones, and the peaceable intermingling of two of America’s most prominent faiths, elevated this story to front-page news. The whole thing felt like a revival, like you couldn’t possibly leave here without rediscovering faith in something, even if it was only the Romney tax plan. The Sports Illustrated writer Dan Jenkins once referred to the Notre Dame campus as “self-haunting,” and everywhere, in case you left your sepia-filter glasses at home, there were blatant and over-the-top reminders that this is a place like no other: My press pass was adorned with silhouettes of the Four Horsemen, and on my way back from Touchdown Jesus I passed statues of both Rockne and Lou Holtz. For a long time, dating back to the Dr. Lou teams of the late 1980s and early 1990s, all that history has felt more like a sinkweight than a cudgel, but it is hard to deny that something has happened in the last couple of months here, amid Notre Dame’s 125th season of football. Until last weekend, the Irish defense hadn’t given up a touchdown in more than a month; they’d beaten Michigan and Michigan State and Miami, allowing a total of 12 points, and they’d outlasted Stanford in overtime on at least two controversial calls that only reinforced the notion that this Irish team was a throwback to the days when all that history actually counted for something. I mean, how long has it been since a Notre Dame team haunted someone other than themselves?2 It would appear they’re finally good enough to get lucky again. This may actually be the most likable Notre Dame team of my adulthood, in part because we’ve forgotten why we hated them so much in the first place, but also because their star linebacker, Manti Te’o, a devout member of The Church of Jesus Christ of Latter-day Saints, dealt gallantly with the loss of his grandmother and girlfriend over the course of a single week. The Irish have built a formidable defense with a patchwork secondary, and they have won games despite employing a pair of deeply flawed quarterbacks: sophomore Everett Golson, who missed last Saturday’s game with a head injury, and junior Tommy Rees, who was nearly driven out of town after an alcohol-related arrest in the offseason, but has now become the latest reclamation story in a program that thrives on such narratives. Even Kelly seems freer, less constrained; during a press conference last week, he actually compared himself to the Avon Lady. “We’re no longer crossing our fingers,” said Te’o, who will likely wind up as the latest defensive player to serve as window-dressing at the Heisman Trophy ceremony. “We’re no longer waiting for the other shoe to drop.” I asked Te’o what exactly had changed, or how it changed, and he gave me a few clichés about players finally understanding what it takes to win, and I tried to ask a non-serious question about whether mysticism had anything to do with it, and he (wisely) responded to that question with a cliché as well. Sometimes, there are things that are better left unexplained. I‘ve heard a hundred other coaches utter the same things Kelly said on Saturday, and I’ve heard dozens of other teams latch themselves to abstract concepts like this, and normally, I am inclined to dismiss it as so much Tebowistic hooey. But at Notre Dame, these things matter, because this is how the program markets itself. I imagine when Kelly utters a statement like “they believe they are going to win football games; doesn’t matter if they are behind,” he knows exactly what he is doing; he is selling the “return” of the Notre Dame aura for a generation that has largely grown up without any assurance in it at all. Embrace who you are. There is a section of the school’s game program — whose cover mural, in celebration of Notre Dame’s 125th season, carried images of Ara Parseghian and the leprechaun and the Golden Dome and Joe Theismann and the Play Like a Champion Today sign — titled “Last Minute Wins and Losses.” I don’t know if this is entirely unique to the Irish, but I’ve never seen anything like it in any other game program, and I think it speaks to the way the Notre Dame fan base views itself: As constantly teetering on the knife’s edge between miracles and disappointments, with fallow periods and moments of doubt but, in the end, sustained by fidelity. This is why they are beloved, and this is why they were once hated from sea to shining sea (and will be again, if they string a couple of successful seasons together). And I should say here: It is very possible that Kelly’s budding narrative will be crushed Saturday in Norman, Oklahoma, when the Irish face an Oklahoma squad that’s put up an average of 52 points in its last three games. I don’t sense a great deal of confidence among the Irish fan base; they’ve spent so long waiting for the other shoe to drop that they are bracing for the eventual boot to the face that will derail this increasingly improbable season. But this is precisely why Kelly’s postgame sermons matter, both from within the program and without: The best Notre Dame coaches have always been evangelists — hence Charlie Weis’s abrasiveness being so poorly received — and Kelly finally seems to be embracing that role with the sort of unabashed self-confidence that can cover up his team’s obvious flaws, or the mistakes that might have buried them in years past. Win or lose, maybe the Notre Dame mystique is something tenable again. “That’s who we are,” Kelly said after the BYU game, after his team clung on for dear life, and for the first time in many years at Notre Dame, it felt like a declaration of faith. When a columnist friend of mine insisted he’d seen Nick Faldo in the press box, I presumed he’d lost his mind. But these are the sorts of random celebrities who still flock to Notre Dame, since it serves as a proxy for college football at large. Also, when was the last time an undefeated Notre Dame team, this late in the season, was ranked as low as fifth? Is there any greater evidence of the cumulative national loss of faith in the Notre Dame mythology than this?